Ladro Decaf blend is delicious. No qualification necessary. It’s a great coffee in its own right, minus the caffeine, because we use the same care with Decaf as we use for all our blends. We select amazing, seasonal coffees, and blend them with a specific flavor profile in mind. 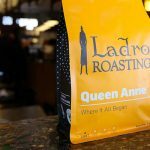 Caffe Ladro prizes quality in our coffees; our decaf is no exception. If an exceptional decaf coffee is on your list, click the image below to purchase. 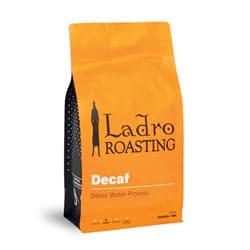 The flavor profile for Ladro Decaf includes notes of roasted hazelnut, grapefruit, and dark chocolate. We coax these balanced flavor elements from the beans with the right combination of time and roast temperature. The result is full flavor in the cup—without the caffeine. After dinner coffee is once again on the menu! 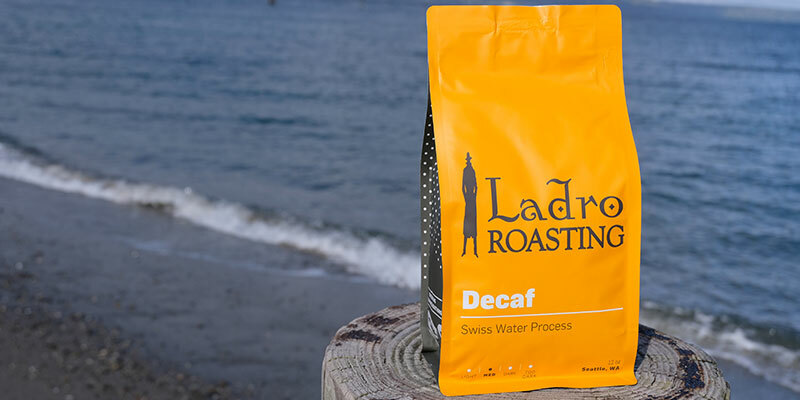 Swiss Water Process is all about creating amazing coffee without caffeine. This “process uses the elements of water, temperature and time to create some of the most intriguing decaf coffee. First, we start with small batches of amazing coffee and green coffee extract. Then we add local water and a dash of loving attention by monitoring time and temperature until the coffee is 99.9% caffeine free.” (Excerpt from swisswater.com.) Caffeine is moderately water-soluble at room temperature, hence the careful attention to temperature and the addition of pure, local water into the process. For more information about Swiss Water process and how sustainable and incredible decaf coffees can be, read more from National Restaurant News with comments from our CEO, Jack Kelly. 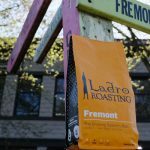 Ladro offers a variety of roast profiles so customers can choose the roasts they most prefer. We light roast most of our Micro-Lot coffees, to help those coffees maintain most of the original flavor characteristics in the coffee beans. We dark roast our Diablo to bring out the bold, roasty flavors that mellow so nicely in a bit of milk or cream. Our medium roast coffees, however, are carefully roasted to be perfectly balanced between the complex original flavors of the coffees and a rich body. Ladro Decaf Blend is very similar to Ladro Espresso: both are not only blended for balance, but also roasted for balance as well. The middle roast road is one worth taking. Enjoy a flavorful cup of Ladro Decaf and sleep well.